This past July I was asked to be a judge for the National Beef Cookoff; with some irony the request included information on what I could expect including having my travel arrangements handled for me. How cool was that? Well, except my travel itinerary would basically consist of: Get in car. Drive approximately 4 miles. Done. Yep…held right here in south suburban Denver just a couple of miles from my home. I was OK with not having to fly anywhere and I did get a room in the same hotel the other judges stayed in near me; I was also beyond OK with a mini break from work! The National Beef Cook-Off is a Beef Checkoff Program that began in 1974 as an annual contest and changed to a biennial contest in 1993. The Cook-Off is managed by the American National CattleWomen, Inc. and is considered to be among the top three cooking contests in the nation. It was an honor to be asked but I had no idea what to expect. I sure didn’t expect to have so much fun! 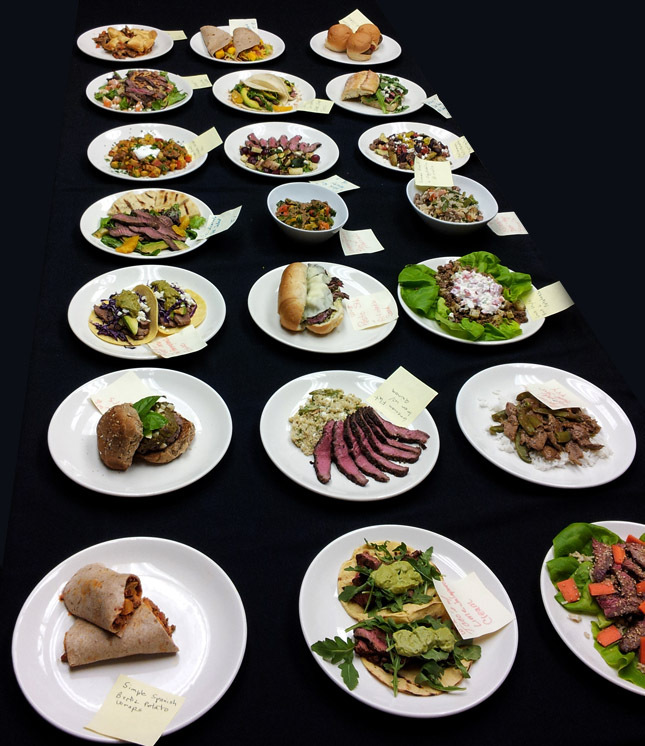 We tasted each dish and assigned a point total based on our personal observations as to presentation, taste and fitting the criteria of the category it was entered into. My co-judges included: Kristen Browning-Blas, food blogger of Colorado Table and food editor for the Denver Post (that’s Kris in the ‘Meat Dress’ that she found on a rack in the kitchen! ); Kathy Moore, food consultant, cookbook author and blogger of PluggedIntoCooking.com; and Leslie Green, food blogger of The Hungry Housewife and food contributor to Creative Loafing. The most difficult part of this contest was having Kathy and Leslie fly off to other states. I’m lucky that Kris and I are both local and can keep in touch; it really was a unique bonding experience! You know what? That’s a LOT of beef in two days. When we all went out to dinner after our first day I’m thinking salads were on the minds of most of us! I met some wonderful people and have to admit I had a great time. Every judge there took this effort very seriously. I have a good friend who enters contests of this nature and Karen’s dish was just awarded as one of the winners at the recently completed Pillsbury Bake-Off. I know firsthand how much these events mean to the contestants and just how much time and attention they put into their individual efforts and we all wanted to be sure we put careful thought into our decisions. I appreciated that our judging panel could discuss each dish and ask questions of the moderator; they even allowed us to change something down the road if we felt that a score given early in the process needed revising based on dishes we tasted as we went along. That seemed fair; it wasn’t about the last guys having to find a spot, it really was all about determining what we thought the best dishes. Awards were given to each region that the recipes came from and regional winners were announced within days of our judging. One overall winner was selected and announced as the $25,000 Grand Prize Winner on November 2, 2013 at the Metropolitan Cooking & Entertaining Show in Washington D.C. Abbie Argersinger of Austin, TX took the grand prize for her Cali-Avocado Steak Salad which included boneless beef top sirloin steak, olive oil, salt, pepper, a large navel orange, a fresh California avocado, naan bread and mixed salad greens. It was fresh, tasty and featured the beef in a simple yet delicious fashion. One of my favorites from the judging was this Balsamic and Blue Cheese Steak Sandwich from Emily Sullivan-Detwiler who was the winner of Region 6. I loved everything about this sandwich and it was the perfect dish to prepare a couple of weeks ago when I had friends over to watch a Broncos football game and I know they’ll be requested again! Abbie’s salad is next on the agenda now that we can finally let the cat out of the bag. Perfect for after the holidays when lighter fare will reign supreme. Combine fennel seed, 1/2 cup balsamic vinegar, 1-1/2 tablespoons olive oil, salt and pepper in small bowl; mix well. Place beef steak and marinade in food-safe plastic bag; turn steak to coat. Close bag securely; marinate in refrigerator 6 to 24 hours. Remove steak from marinade; discard marinade. Place steak on grid over medium, ash-covered coals; grill steak, covered, 11 to 16 minutes (over medium heat on preheated gas grill, covered, 16 to 21 minutes) for medium rare (145°F) to medium (160°F), turning occasionally. Carve steak diagonally into thin slices. 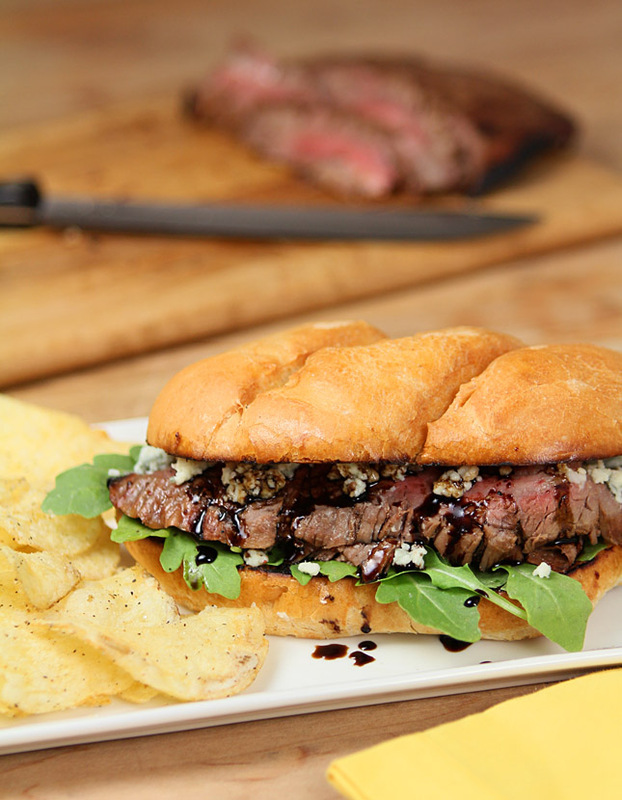 Place steak slices on bottom half of bread, top with arugula and blue cheese; drizzle with remaining balsamic vinegar. Top with second bread slice and serve. If you’re interested in this contest, be sure to check out these facts for some basics. This contest is open to amateurs only; if you’ve ever made money from blogging or contests or recipe development you are not eligible to enter. Thank you for this write up! I am the creator of this recipe and I entered it into the contest on a whim, my first try at a recipe contest!! My husband is an ex-football player and loves gourmet sandwiches so I am always creating them… My newest is a Bahn Mi that is insanely good (maybe even better that the blue cheese). I also make a Chicken Caprese sandwich that melts in your mouth! So good to hear from you Emily! I knew I would love this sandwich just from the sound of it and you did not disappoint! What a fun experience! And this sandwich is absolutely glorious! Yay, glad to see this posted after hearing about it at lunch! and omg I want that dress!!! Isn’t that dress a riot. Kris found it and was nervy enough to go and try it on…and it fit! She was a trouper and it’s one of my prized phone photos of all time. Sounds like a neat experience, Barb! I think this combo of steak with blue cheese is right on– too bad only one dish can win the grand prize. I am sure lots were beyond delicious! 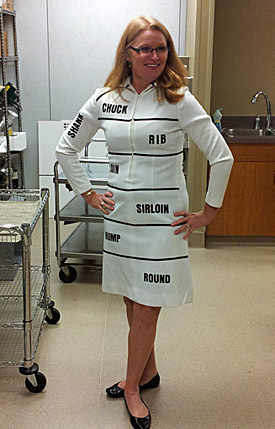 I just love that meat dress, Barbara… and what a task you had, judging all that beef! Love this sandwich, would be definitely something I’d like to make! How fun you were one of the judges for the National Beef Cookoff! Sounds like fun to me. 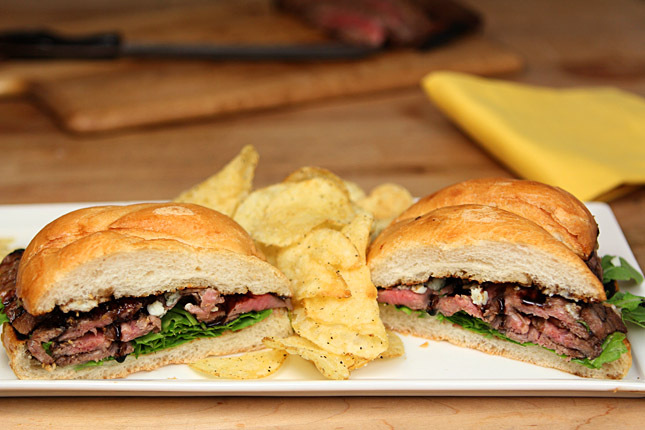 And I can’t wait to try this Balsamic and Blue Cheese Steak Sandwich! Totally something I would enjoy! I am in love with this sandwich! I’d never ask for anything else if I got this for lunch. Sounds like such a fun experience! That’s a lot of beef to sample, though – I’d have been so ready for a salad for dinner too. If I could even face dinner! 😉 I like this recipe – looks like a pretty good sandwich. Good stuff! 😉 Thanks. The recipe is just up my alley….since I always have blue cheese in my fridge. It is interesting to hear about the judging for the event…and the rigor of it. I’m sure the contestants, who put so much effort into developing good recipes, are happy to know the judges take their jobs seriously. I have to admit, I always enjoy checking out the beef recipes from this contest. Any chance you’ll be judging again this year? It’s now a biennial contest Jane so not this year. I imagine they’ll want different judges but if asked I would sure do it again.